A few nights ago, my husband and I were watching the “Dual Spires” episode of Psych. For those of you unfamiliar with the show, the “Dual Spires” episode is a spoof of Twin Peaks, complete with cast members from Twin Peaks. The set up for Shawn and Gus of Psych to go to the small town of Dual Spires is a mysterious email inviting them to a cinnamon festival. When they arrive, Shawn and Gus go to a local restaurant called the Sawmill and they are served cinnamon pie. 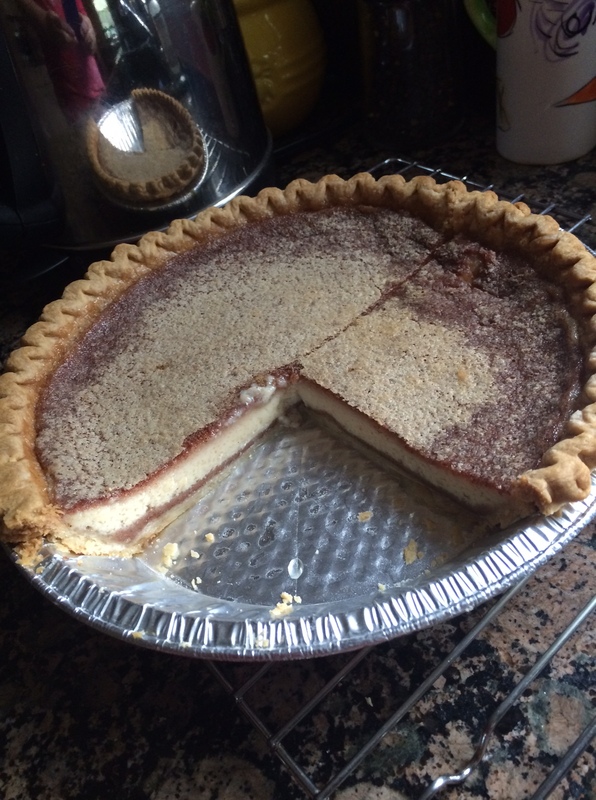 At this point in the show, my husband says “I want cinnamon pie.” And then I wanted cinnamon pie too, so I went online to discover that many people, after watching this episode of Psych, wanted cinnamon pie. Luckily someone posted this recipe. There were some suggestions for substitutions, so this is how I made it. Preheat oven to 400 degrees F. In a large bowl, combine the sugar, flour, cinnamon, and salt. Add the beaten egg, butter, and vanilla. Mix well and add the milk. Pour mixture into an unbaked deep dish 9-inch pie crust. Bake at 400 degrees for 15 minutes, then reduce heat to 350 degrees F and bake for an additional 45 minutes. Let cool and serve. Refrigerate any leftovers. It’s delicious. 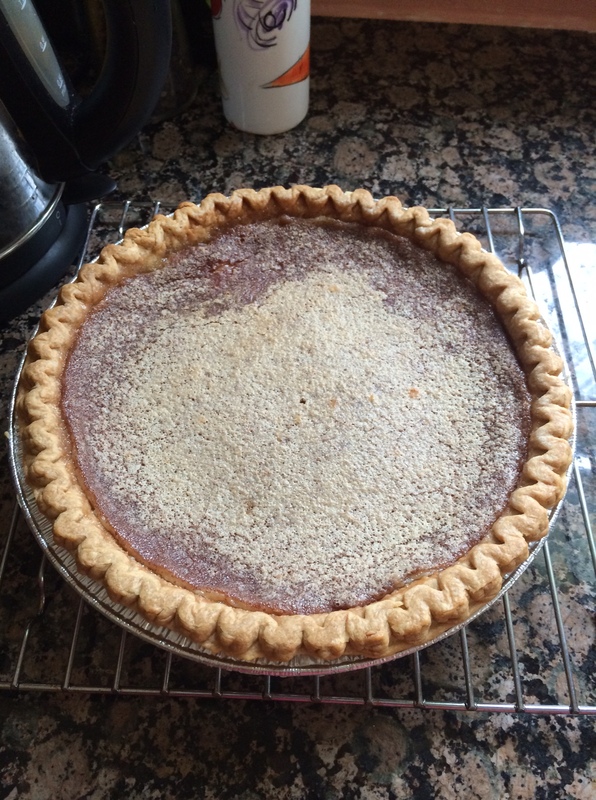 And since I always have the ingredients on hand, it’s now my go-to pie for last minute dessert needs. I just need to make sure to always have pie crusts in the freezer. Birds are mysterious in their ways and thinking. A couple of robins have taken up residence in the nest over my floodlights. I don’t know if they were the original builders or not, but they have made improvements, and they are definitely nesting. Male and female are both nearby and one of them is always sitting on the nest. I fear this will not end well, my friends, not well at all. Take six pork chops, put them in a 9×13 pan with a tablespoon of butter and a tablespoon of brown sugar on top of each chop. Sprinkle the whole thing lightly with soy sauce, cover with foil and bake in a 350 degree oven for 30 minutes. Uncover and bake for an additional 15 minutes. Simple. Only this time, I got thinner chops than I usually get, wasn’t paying attention and the chops came out dry. Because my husband is a trooper, and can eat anything, he ate them for dinner and said they tasted great. I love him. But they were dry and awful. We had three chops left and I hated to throw them out, so I stuck them in the food processor with salad cubes, onion, black pepper and some mayonnaise and made pork chop salad, which is just like ham salad, only different. It turns out pork chop salad is good on marble rye. Who knew? Feel free to tell me about any of your food recovery tricks. Cleverness loves company, just like misery. It turns out birds might be smarter than I thought. After going through the trouble of building their nest on my floodlights, they apparently realized that raising their chicks near a busy door as well as an even busier dog door was a bad idea. Kudos for bird brains. 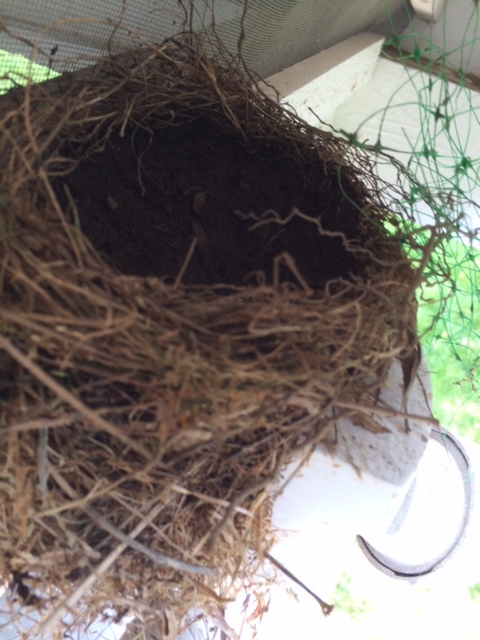 I haven’t seen them at all and there is no egg in the nest. Unfortunately, the nest is just high enough that I can’t quite reach it with a broom, so it remains intact until I can get up there. Since it’s unoccupied, it doesn’t really bother me. It’s a nice nest after all. 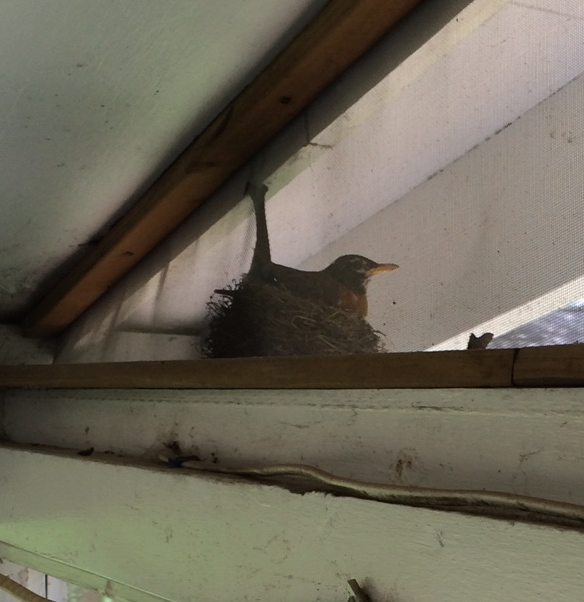 I know it seems like the paired floodlights outside my porch make for a good location for a nest. After all, being a pair, they provide two sturdy sides to build upon and I see you’ve noticed that I put Cory’s hair, when I trim her, quite nearby, which makes for warm, soft bedding for your new egg. I also see that you’ve managed to find some sturdy nylon netting for additional support for construction. Nice job, bird couple, way to recycle. Alas, I don’t think you’ve met our new addition. His name is Storm and he’s a basenji. Unlike our last basenji, who didn’t care for birds, Storm is like our first basenji, who loved them. By loved, I mean to death, like birds are fun to chase, and watch, and crush when the moment arrives. Granted Storm is still a baby, and hasn’t managed to kill a bird yet, but if past is prologue, you guys are in for a world of hurt. So here’s what’s going to happen. I’m going to climb up on a chair and look to see if you’ve already laid an egg. If you have, I’ll let nature take it’s course and this will play out however it plays out. If you haven’t laid your egg yet, I’m knocking your carefully constructed nest down. I’m sure it was a lot of work, but seriously, this probably won’t end well, and I’d rather not have your tiny bird blood on my hands and your crushed little bodies in my yard. I apologize unreservedly.